HOCKEYGURL DESIGNS develops business websites for organizations large and small, all with their professional needs in mind. Listed below are current and past business website projects. Site packages include design, development and content management, with a renewable maintenance agreement available after one year. Contracts may also include domain registration and hosting, search engine optimization, social media marketing, and any other services that may be required. This website has been developed for a general consulting firm in the Midwestern United States. 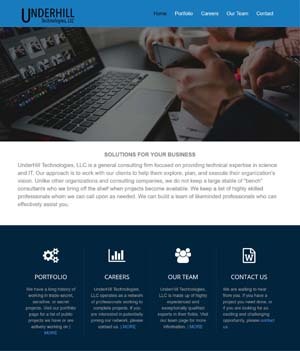 UnderHill Technologies is focused on providing technical expertise in science and in IT. 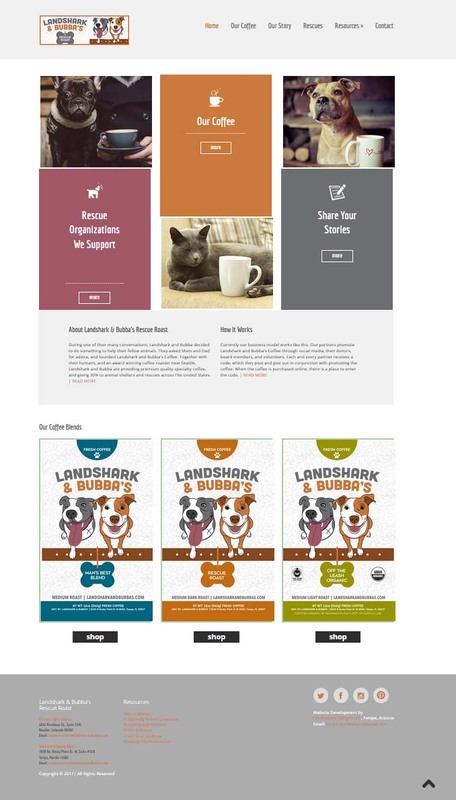 This website was developed in conjunction with an East Coast non-profit organization supporting animal rescue organizations through the sales of its coffee. HockeyGurl Designs was esponsible for design mockup and development for new website in responsive HTML5, as well as buildout and maintenance of approved format and installation of e-commerce functionality. This organization is no longer active, and the website has been taken down. It is only available by request, as it has been removed from the web to prevent theft of graphics and information. 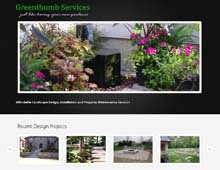 This website was developed for a landscaping business in Fort Wayne, Indiana. They provided complete lawn maintenance and renovation, landscaping design and installation, and snow removal services in the off season. This website features an interactive portfolio, as well as individual photo galleries of their most recent projects. Unfortunately, this business has closed. The website is still available for review of design features and project portfolios. Responsible fo design, development and content management of new website, including new shopping cart updates and content for Oodles of Strudel, an e-commerce site for authentic German strudel. 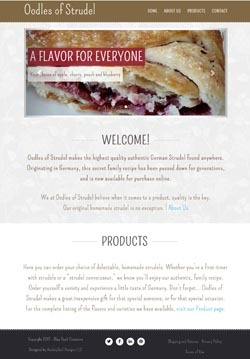 Site includes on line ordering for more than 12 varieties of strudel, including options for size and ingredients. Also includes personalized gift bags. Bell Mar Plaza is a neighborhood center featuring popular restaurants, boutiques, retail shops, and offices. Our bold architecture and strong street presence on Bell Road just as you enter Surprise, Arizona is the perfect location for your business! The plaza opened in 2009 with lease space available for both retail and office users. 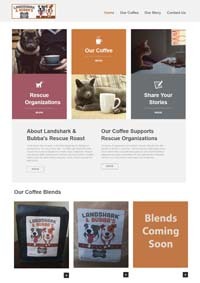 A website designed for an incubator that provides retailers with a venue for their businesses. The incubator space has the look and feel of a London or Paris street, with cobblestones and overhead party lights. It includes features about each of the retailers, newsletters, and an events calendar that can be updated by the incubator owners. It will soon have a blog, which was designed to match the website. 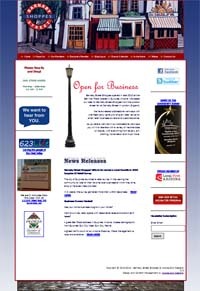 This website was done in collaboration with a local marketing company. Retailers are updated monthly. A website designed for an independent museum consultant who provides expertise and execution of historical upholstery for museums, private collectors, auction houses, and dealers, with experience in the brokering of fine and decorative arts. Trent has also recently launched TrentShirts, unique and one-of-a-kind graphic T's based on a variety of motifs. High quality, affordable music is personalized for your special occasion. 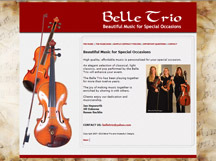 An elegant selection of classical, light classics, and pop performed by the Belle Trio will enhance your event. The Belle Trio has been playing together for more than nine years. The joy of making music together is enriched by sharing it with others. Clients enjoy our dedication and musicianship. For the Hippie Gypsy in your soul! 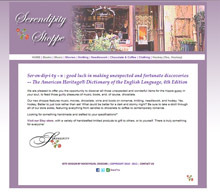 The Serendipity Shoppe offers you the opportunity to discover all those unexpected and wonderful items for your inner Hippie Gypsy, to feed those guily pleasures of music, books, and of course, chocolate. This shoppe features music, movies, books, coffee, chocolate, needlework and hockey. Yes, hockey! After all, what could be better for a dark and stormy night than a good book, great music and chocolate, except maybe a good hockey game? 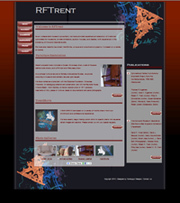 This website was developed for a client in Lugo, Ravenna, Italy. We have installed a copy of the original website here so that it is available for review. The Guesthouse is now part of the AirBNB network. The Italian Guesthouse provides you the unique opportunity to live in the historic centro storico of the pretty town of Lugo, 20 miles inland from the Emilia Romagna coast. 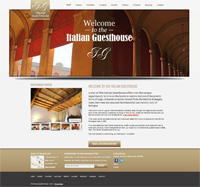 The website we created provided photo galleries of the guesthouse and the area, an events calendar for visitors, history of the area, booking information and more. We designed and developed the website and passed it to the client for management. 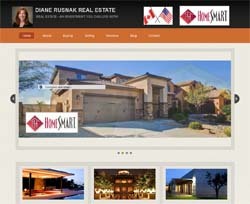 This website was developed for a local Scottsdale Realtor. It provided access to the latest listings through the Multiple Listing Service, with a search function for home buyers. The site is now part of the HomeSmart network, which controls all member realtor websites. The site contained information for buyers and sellers about the ins and outs of home purchasing and selling, as well as a complete list of services provided by the Realtor. We designed and developed the website and passed it to the client for updates and management. The website is now controlled by the parent real estate company and has been redesigned under their brand. The issues with the site are the responsibility of Home Smart Corporate. 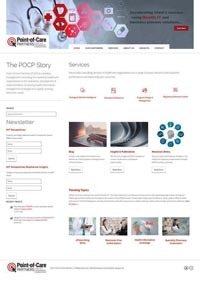 Point-of-Care Partners (POCP) is a leading management consulting firm that assists healthcare organizations in evaluating, developing and implementing winning health information strategies in an evolving electronic world. Their work takes their staff all over the country, working with clients, presenting at conferences, attending industry meetings, and their website reflects their global outreach. Their website features newsletters, presentations, white papers, blog entries and interative information on ePrescriptions. The website has recently moved to a WordPress platform and is now being maintained in-house by POCP employees. 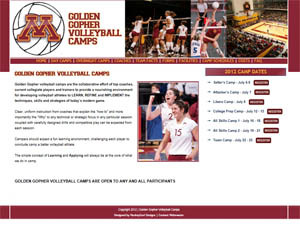 This website was designed for a volleyball camp affiliated with the University of Minnesota. It contained information and registration for a variety of volleyball camps open for participants during the summer of 2012. These specialized camps offered training and instruction in a variety of skills at all levels. Campers were able to register for camp directly from the website. Registration for 2013 camps are being coordinated by the University of Minnesota website. This website is no longer active, as the 2012 camp has been concluded, but a PDF screenshot is available by clicking on the image on the right. Gelato Matto was a cafe in Phoenix, Arizona that offered a healthy, nutritional menu including 38 flavors of freshly made gelato every day, made right on the premises. 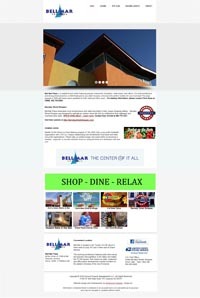 The website included full menus, nutrition information, the history of gelato, photos, and news items about the cafe. 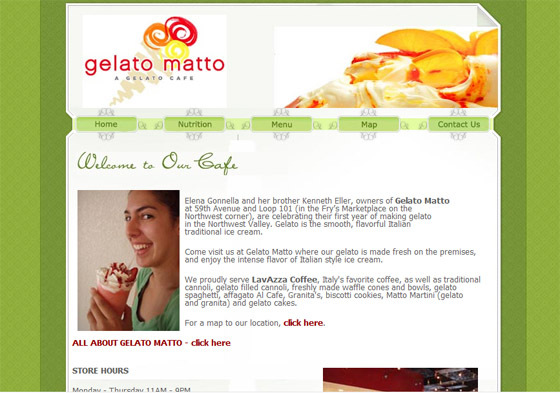 Sadly, for all of us, Gelato Matto closed its doors in late 2009. We thank them for the hand-delivered cannolis! 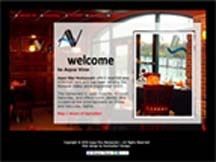 Aqua Vino Restaurant offers seafood and American fare, and has been serving the Mohawk Valley, New York since September 2007.The restaurant is operated by Robert Esche and business partner Alicia Dicks, who opened Aqua Vino Restaurant & Banquets at the Utica Historic Marina facility. Robert Esche has been an NHL goalie since 1999 and has also played in the Russian Federation, Switzerland and in Belarus. Esche is a Westmoreland resident, Utica, New York native and former Whitesboro and Notre Dame high school athlete. The thumbnail on the right shows one of two previous designs of the restaurant website, which has had four site designs to date. Another design, a lighter, more "cafe" inspired design, can be viewed here. The current version of the Aqua Vino site is hosted by a Utica PR firm, which has redesigned the site, seen here. 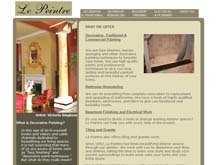 This website was originally designed for a Virginia-based interior design company, the sister company to a renovation/construction company. Now renamed Mavlian Interiors, this company offers interior painting and remodeling services. This original site included flash galleries of each type of service provided by the company, as well as galleries showing "works in progress." Our original design for this company has been replaced by an in-house WordPress site for the renamed company, Mavlian Interiors.